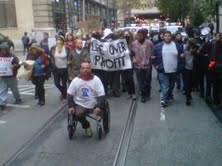 Is Occupy Philadelphia Facing a Crossroads? Yet the controversial action highlights something of a dilemma for the occupation here in the City of Brotherly Love, and this stems from the much-lauded relationship the administration has forged with the protesters. On its face, this appears to be a very good thing. No one has been injured or killed and the city has not been disrupted in any significant way. It’s a very positive anomaly in a sea of reports about police brutality against protesters. But it may pose a problem for the growth of this movement here, as the number of occupiers appears to have leveled off and a potentially difficult winter approaches. There are some characteristics about this very different occupation worth considering. The Project will continue to bring you reports and editorials on the #Occupy movement, with emphasis on events from @OccupyPhilly. If you have photos, writing, artwork or music with a focus on the Occupy movement or with protest culture in general, don’t hesitate to send it to DGP. We’d love to share it with the world. Thanks so much for your continued support and and if you’re new to the Project, welcome! 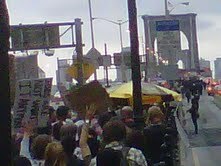 This entry was posted on Tuesday, November 1st, 2011 at 6:34 pm	and tagged with #OccupyOakland, #OccupyPhilly, #OccupyWallStreet, activism, Brooklyn Bridge, brutality, NYPD, Occupy Philadelphia, police, politics and posted in Editorial, News/Report. You can follow any responses to this entry through the RSS 2.0 feed. Only time will tell. The movement isn’t going anywhere – especially in Philly. Even if we “hibernate” through the Winter, I suspect numbers will swell in the Spring; regardless of what the administration/police do or don’t do. It might help to become familiar with what happened with police actions and MOVE in 1978 and it’s impact on the city government vis a vis their approach to protest in Philadelphia. I think that is a strong part of the cultural and racial memory and it might answer your questions about the future of progressive movement here. Thanks for reading Yvonne. So do you think that the police action directed at MOVE have had an impact even on today’s generation of activists? ABSOLUTELY. You underestimate the trauma of watching a gov bomb it’s own citizens. If you really want progress, stop haggling over turf and get on with the real issues of #OWS. Perhaps Phillies contribution to the movement can be a model of peaceful change. This inability to become a cohesive group over this issue has wasted valuable time and created a high rate of attrition from a city that was originally in full support of the movement. Suggest you work to create a safe ‘container’ for the work. As one in Philadelphia, a political/social observer, and an activist in my undergraduate days, I think this article is a bit mooted. My sense is that Occupy Philadelphia will continue to take positions on issues that will contest established city interests –in other words, raise the level of accountability. Occupy Philadelphia has already testified before city council on a youth curfew matter (it passed and became enacted); has stated the intention to stay at the City Hall plaza despite a redevelopment proposal (fix the city first before spending $50mm on a project largely benefiting downtown office workers and tourists); and, has started taking on local/state policy issues such as the recent civil disobedience at the headquarters of cable/mass communications giant, Comcast. That said, these actions are not necessarily long-term/permanent/institutional. One would think an outlook towards this would be considered. In other words, “wear some ties, not tye-dyes.” Maybe there will be some political/electoral action as to the May 2012 primaries. That however, requires a level or sophistication that may not be sufficiently available. 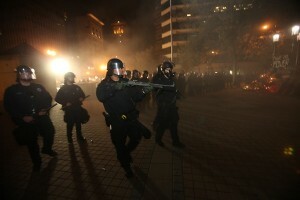 In addition, if and when Mayor Michael Nutter wins reelection, the City Hall-Occupy relationship may change. That said, President Obama needs a great electoral plurality from Philadelphia (and it’s region) to counterbalance the rest of the Pennsylvania. The youth vote is an important part of that demographic. As such, there may or may not be a counterbalancing of interests here. Personally, I hope Occupy Philadelphia focuses and creates a sharp, cogent narrative on unfair and/or institutionalized economic/governmental practices that control the levers of our “market” economy –practices that explain and counteract the harms being done. Only by making people understandably aware will a larger shift occur. P.S., I’m sure there is very little awareness of the MOVE bombing and as such,very little impact. It was well over 30 years ago.